If you want help with YOUR writing, come see us! Here are the hours for this week…no need to make an appointment; just drop by! 7:15 p.m. to 8 p.m.: LITERARY LIONS! Come write, share your work, or just sit back and listen! 7:45 p.m. to 9:45 p.m. Launched in 2004, GLSEN’s No Name-Calling Week invites educators and students across the country to engage in dialogue about eliminating name-calling and bullying in their communities. Inspired by The Misfits, a young-adult novel about four friends who campaign for student government on a “no name-calling” platform, the program is part of GLSEN’s efforts to create safe and affirming schools for all K-12 students. 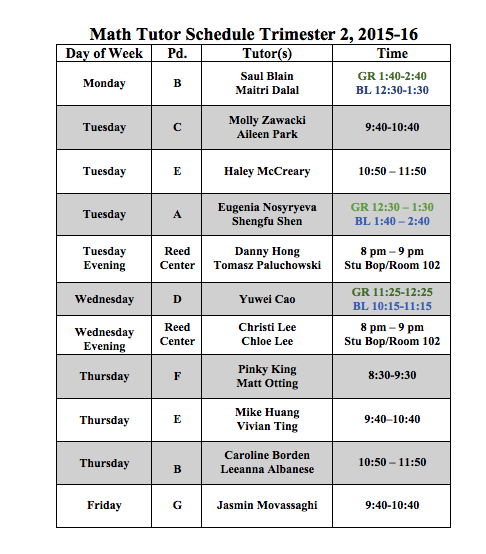 Just wanted to make sure you had the tutor schedule readily available so that you can plan your week around when you are going to go get that extra help you have been considering! We have been back in school for two full weeks so I imagine there are some upcoming tests. 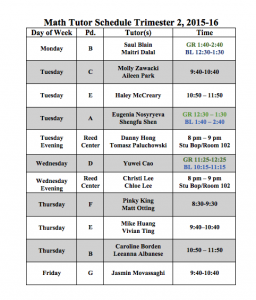 The tutors are excited to help, so don’t hesitate to go see them… and bring a friend! They look forward to doing math with you! The annual Casino Night will be held in the StuBop on Saturday, January 16, 8:30-10:45 p.m.
Raffles will be drawn at 10:30 p.m.
Get your free chips to start and exchange them for raffle tickets. Come have some fun with your friends Saturday night in the StuBop! Contact Director of Student Activities Matt Spearing with any questions. The 26-member cast of In the Heights will head to New York City on Wednesday, January 20—leaving at 7:00 a.m. and returning by 9:30 p.m.—to attend a lecture and workshop at CUNY’s Dominican Studies Institute, and eat lunch in the city. Afterwards, students will attend a performance of the Broadway musical Fun Home, tour Washington Heights, and have dinner at El Malecon, a legendary Dominican restaurant in the neighborhood. This is an optional event for the student cast members of In the Heights. (Members of athletic teams, especially varsity, may decide to participate in an athletic contest instead of going on the trip.) For more information, contact faculty chaperones Emily Ditkovski, Debra Vega , or Josh Harper. Below is the schedule for winter season team photos scheduled for next Monday and Friday. Attitude is everything…put on your rain/snow/mudboots and make a visit to the Writing Center today! Be Even More Awesome in 2016. Remember, no need to make an appointment: just drop by! I hope you had a terrific first day of classes! I know I did. We had so much fun playing with Geometer Sketchpad today – lots of investigating and conjecturing! There is, of course, vocabulary to learn and homework to be done, so I wanted to take a moment to remind you of the fabulous resource you have here at Williston – the Math Resource Center Tutors! They are just waiting for you to arrive with your questions so that they can help you and learn even more about all of the intricacies of the math you are doing! Remember that you can simply show up – no appointment necessary. 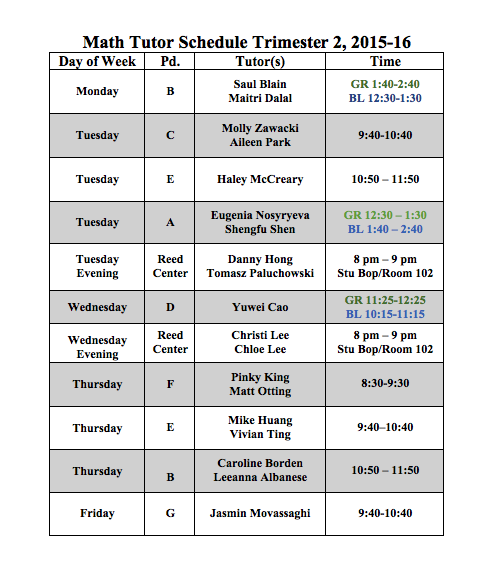 The daytime tutoring sessions are in Schoolhouse room #28 and the evening sessions are in Reed room 102. I hope the rest of the week is just as much fun as today was! Sherrie Ann Gordon ’00, a wonderful young alumna, recently passed away. To honor her, her friend Pierce Freelon, Class of ‘02, decided to dedicate his new song to Sherrie. iWilliston would like to encourage everyone to submit a #DoinWhatILove video. To submit your video, you can use the hashtag #DoinWhatILove and @thebeastmusic. Or send them to iWilliston@williston.com and we’ll submit them for you.